Salpichroa origanifolia. Reproduced from Jessop & Toelken (eds) Flora of South Australia 3: 1253, fig. 572 partly (1986). Salprichoa rhomboidea flower detail. Reproduced from Engler & Prantl's Die Natürlichen Pflanzenfamilien IV 3b, fig. 12K (1897). Salpichroa Miers, London J. Bot. 4: 321 (1845); from the Greek salpinx (trumpet or tube) and khroia (skin or complexion), in reference to the form and texture of the flower. Type species: S. glandulosa (Hook.) 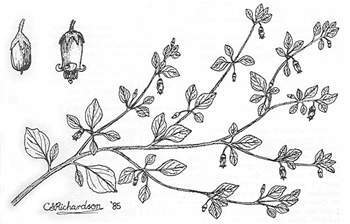 Miers; Atropa glandulosa Hook. Scrambling or climbing perennial herbs, glabrous or pubescent with simple hairs. Leaves alternate, 1 or 2 per node (but not opposite) simple, entire, petiolate. Flowers solitary in leaf axils, bisexual, regular. Calyx deeply 5–lobed. Corolla urn-shaped, white or yellow; limb 5–lobed, the lobes reflexed, valvate in bud. Stamens 5, equal in height, inserted on corolla-tube; anthers bilocular, not cohering, dorsifixed, dehiscing by longitudinal slits. 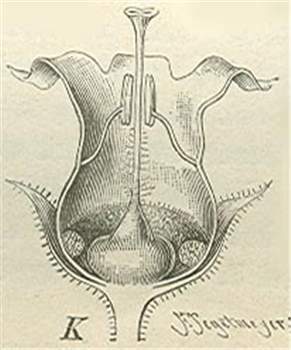 Ovary bilocular, an annular disc prominent at base; stigma capitate. Fruit a berry. Seeds disc-shaped. A genus of 20–25 species native to South America, mostly found at higher altitudes in the Andes. S. origanifolia, originally cultivated and now naturalised in southern Australia, is the only species found at lower altitudes throughout S. America; it is considered a weed in many parts of the world. D.E.Symon, The solanaceous genera, Browallia, Capsicum, Cestrum, Cyphomandra, Hyoscyamus, Lycopersicon, Nierembergia, Physalis, Petunia, Salpichroa and Withania, naturalised in Australia, J. Adelaide Bot. Gard. 3: 133–166 (1981). There have been no changes since the Flora of Australia treatment. Only Salpichroa origanifolia is known from Australia.